Have you noticed any brands using first-person point-of-view in their advertising content recently? This marketing technique is gaining some traction; popular brands such as Google, Apple, and GoPro have used first-person imagery in their recent advertising campaigns. First-person POV imagery depicts events as seen through the character’s own eyes, whereas third-person imagery depict events through the eyes of an observer, who is viewing an action take place. While there is a mass of academic literature indicating that POV significantly impacts how an image is both processed and perceived, this research has not extended to the advertising world. Therefore, there is little information available on the effectiveness of first-person POV in ad imagery as a marketing technique. Right Left Agency partnered with a USC Master of Science student to conduct research on the effect of POV on advertisement effectiveness. 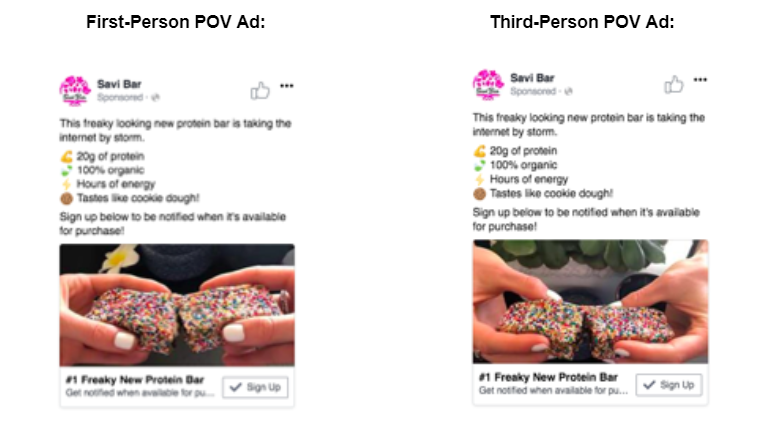 Using real advertising content, we compared the effectiveness of two identical Facebook ads, only varying the POV of the ad image (first-person vs. third-person). The findings may help you make decisions about your advertising content. Facebook advertisements were created using a fictional brand called “Savi Bar”. Organic protein bars were chosen as the product due to the large market, online purchase ability (easy to order/ship), and marketability. The ads were identical in content, only differing in the POV of the product photo. The Facebook ads were displayed to a sample of Facebook users, ages 25 to 50 years, college graduates, and had ‘liked’ My Fitness Pal. This demographic was chosen as they were presumed to be most interested in “Savi Bar”. With a budget of $300.00 and a three-day time span, the performance of the two Facebook ads were recorded. The performance of the two ads, based on total engagement (likes and comments combined), clicks, and conversion rate was analyzed. In total, the two ads reached 15,312 people, were clicked 355 times, with a click-through rate of 2.65%, and generated 140 leads. Overall, the first-person POV ad outperformed the third-person POV ad in all variables measured— except for immediate conversion rate. Specifically, the first-person POV ad gained 9% higher clicks (185 vs. 170), and 43% higher total engagement (n=32 vs. n=14) compared to third-person. 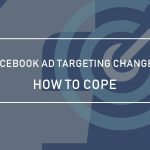 Do to the higher engagement on the first-person ad, Facebook’s algorithm decreased the cost-per-click for the first-person ad by day three of the ad campaign. However, the two ads did not differ significantly in their conversion rate; the third-person ad even collected slightly more leads than the first-person POV ad (71 vs. 69). While the results indicated that immediate conversion rate was not affected in the same way by POV, past research suggests that the higher engagement on the first-person POV ad may lead to an increase in conversion rate at a later point in time. Research by Calder, Malthouse, and Schaedel (2009) found that higher interactivity with online media is positively associated with advertising effectiveness. The researchers used a direct aggregation approach, which allowed for time lags between the stimuli and total sales to be recorded. Based on the results, the researchers concluded that advertising on Facebook significantly affected sales, primarily in the long run and particularly by creating ‘likes’. Despite the low relevance for short-term sales, likes and comments over the long-term were shown to be the strongest cumulative-sales drivers. While likes and comments were found to be a strong determinate of the ad effectiveness, there may be a time-lag between the ad engagement/ interactivity and actual product sales. So, even though the immediate conversion rate was not impacted by the use of first-person POV, the long-term success of the ad campaign may still be superior for first-person than for third-person do to the higher ad engagement. The current study reveals that first-person POV in advertising imagery may in fact offer an advantage over third-person. This may be because viewers are able to more easily place themselves within the advertisement, envisioning interacting with the product. Or, maybe it is the novelty of the imagery, as first-person POV is less common, drawing extra attention. Either way, POV can be a factor impacting the effectiveness of an advertisement, and should be considered in it’s creation. What point-of-view do your ads take?